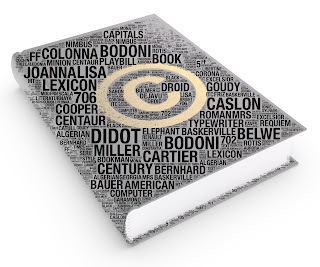 Dear Rich: An Intellectual Property Blog: Do I Have to Pay to Use Pre-Installed Fonts? Do I Have to Pay to Use Pre-Installed Fonts? Dear Rich: I own a Macbook Pro computer that came with the fonts Avenir and Avenir Next in the system. I have used these fonts extensively for my consulting work to produce reports, many of which are available as PDFs (with font embedded) online and one of which may now be printed and sold online. I recently read that I may need to pay for the rights to these fonts. I have asked the Apple copyright division and also asked if they could send me the license agreement for the fonts pre-installed on my computer. It seems like a stretch, to say the least, that I should have to pay to use fonts that came with my computer and have presumably already been paid for. However, I have read conflicting things about how copyright law applies to use of fonts. Here are the general rules regarding copyright and fonts. Typefaces are not copyrightable; font software is copyrightable. The appearance of a font will not be protected by copyright law. However, the software programs that display, manipulate, and modify the font can be protected under copyright. Practically, when working with design programs and with digital publishing files, the font software is inseparable from the font's appearance --- that is, in order to "see" the font, you need to install the software in programs such InDesign or to "embed" it in PDF or ePub files. Embedding a font stores data about the font (not just the appearance of the font) within the document, so that a third party, receiving the PDF or eBook, will see your font as you intended. If it is not embedded, the third party's computer will substitute an equivalent font, sometimes resulting in aberrations. Font software is subject to license agreements. Like most software, font software is subject to licensing -- that is, somewhere along the line you must agree to a set of rules about how you can use the font software, for example, limiting the number of computers on which it can be installed. 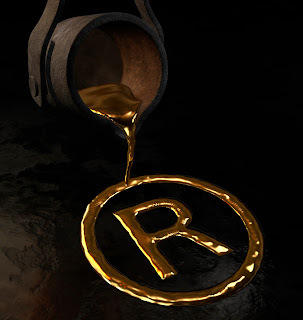 When users violate these licenses and distribute the software without restriction they are infringing copyright. In other words, even though font software may come pre-installed on your Mac, that doesn't mean you can install or embed copies on other machines (any more than you can reproduce software like GarageBand and iMovie on other computers). F. Fonts. Subject to the terms and conditions of this License, you may use the fonts included with the Apple Software to display and print content while running the Apple Software; however, you may only embed fonts in content if that is permitted by the embedding restrictions accompanying the font in question. These embedding restrictions can be found in the Font Book/Preview/Show Font Info panel. Unfortunately, this isn't particularly enlightening because there are no embedding restrictions in the Avenir section of the Font Info panel of the Mac Font Book (see below). (Actually there don't seem to be restrictions posted for any of the Mac fonts). 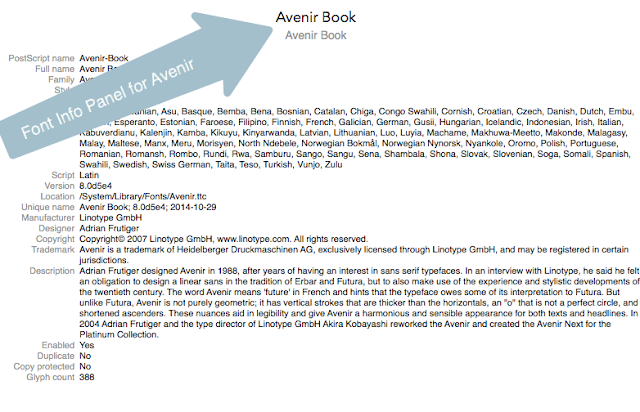 Font Book indicates that Avenir is owned by Linotype Gmbh, a German company. Linotype Gmbh (also operating as Monotype) has a variety of end user licenses and charges $78 for an ePub embed license. Bottom line dept. Apple's failure to place restrictions on its pre-installed fonts makes it more difficult to determine your rights and obligations, if any, when embedding pre-installed fonts such as Avenir. It's always possible your use may trigger a cease and desist letter, but we think it is unlikely. Font foundries are primarily focused on unauthorized reproduction of the software fonts, particularly high profile abuses where companies exceed the number of users in a corporate setting, embed fonts in apps, or flaunt unlicensed fonts in marketing materials. Nevertheless, if you are concerned you may wish to consider fonts from sources such as Adobe which have a liberal embedding policy.